Plus likely a lot of infrastructure and cabling to update obsolete equipment and facilities... plus they run all the radars from the huge missile warning radars down to mobile sets... and... and this is a huge and... and they collate all that data in real time and distribute that data processed into meaningful information back out to the various nodes... huge job for a small country let alone a huge one like Russia. this year compared to last year, more than tripling the number of missiles and ammunition allocated for developing practical tasks military air defense and anti-aircraft missile units. "Work is continuing to develop advanced anti-aircraft missile system interspecific fifth-generation S-500, which will ensure the defeat of the aerodynamic and ballistic targets of all kinds at all altitudes combat use," - he said. The Defense Ministry announced the development of the latest fifth-generation missile, designed to destroy drones. Promising interspecific antiaircraft missile system of the fifth generation S-500, which is currently being built in Russia, can hit any target at all altitudes. The new missile system designed to destroy not only the aircraft, but also the newest versions of the drones. According to Deputy Defense Minister Yuri Borisov project envisages the creation of "promising interspecific antiaircraft missile systems fifth-generation S-500, which will ensure the defeat of the aerodynamic and ballistic targets of all kinds at all altitudes combat use." Borisov also said that this year in the army aerospace defense continue delivery of multichannel mobile anti-aircraft missile system long-range S-400. "Currently at the cosmodrome" Plesetsk "Russian Defense Ministry in conjunction with the Federal Space Agency is preparing to launch space rocket complex" Angara "unified family of launch vehicles light, medium and heavy-duty," - said the deputy minister. According to him, "they will improve the accuracy and reliability of launch payload to the target orbit, the transition to the exclusive use of domestic components and materials, as well as reduce the cost of production, preparation and launch." C-500 is a new generation air defense missile systems, which is supposed to apply the principle of separation solving destroy ballistic and aerodynamic purposes. The main task of the complex - the struggle with combat equipment medium range ballistic missiles, destroying hypersonic cruise missiles, aircraft and UAVs as a conventional high-rise, and type "waverider" (hypersonic missiles), the destruction of low-orbit satellites and space weapons-launched hypersonic aircraft, attack hypersonic drones and orbiting platforms. In late February of this year, the chairman of the Presidium of the expert council of the Aerospace Defense Igor Ashurbeyli said that there is slippage of development and testing for anti-aircraft missiles S-500 complex. He noted that it is possible and degradation missiles compared with the approved terms of reference that, according to him, can doubt the need for further work. I'm sure it could engage different targets, but I thing there will be a lot of other SAM systems around, that S-500 will engage ballistic missiles and LEO satellites only. S-400 and S-350 will be good enough for all other targets. comes a fricking BOOMB !! The Triumf system is more than two times more effective that previous systems. Each system can attack 10 targets with up to 20 missiles. this means that S-400 can engage 60% more targets with 60% more missiles than the best version of S-300 !!! Using a S-500 to swat a drone? That's like shooting down a fly with an RPG. 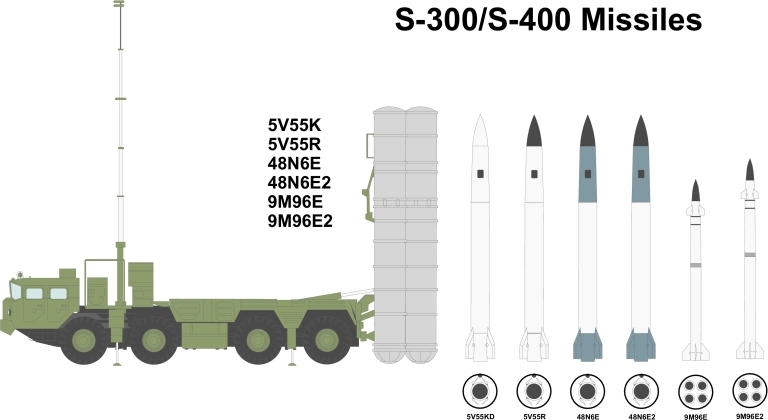 Maybe the S-500 complex will have a selection of smaller missile tubes in the style of the S-400? Say ones for new Pantsir rockets that are designed for economic drone removal? flamming_python wrote: Using a S-500 to swat a drone? Actually people missed the point of the aforementioned "drone", by drone they probably mean the hypersonic drones flying high at Mach 6 carrying kinetic and nuclear weapons, I think it's a given that the S-500 won't be used against reaper drones...you have Pantsir and Tor for that! The range is probably greater than previously advertised as well, and I think Mindstorm once talked about the Russian strategy of information denial. Probably means have 10 channels to engage 10 targets at same time using up to 2 missiles per channel IF they using the small range (9M96E) 40km missiles . Don't think that performance is about the very long range (real point of the S-400 defense )( 40N6) missile with 400km.. Only one missile fit per tube launcher. same with any of the 48xxxx series.With 200km or more range. On another note Wikipedia says S-400 max ceiling is 35km.. is that correct? Usually ICBMs fly at 100km or more altitude. Iskanders at 50km altitude for comparison. For a really strong defense bullet proof defense.. lets say defending Syria.. in the worse possible case scenario ,In case Russia expect an imminent full scale attack from a Turkey ,they will need enough S-400s channels open as combat planes Turkey have or at least as half of their airforce . So Turkey have near 400 planes , Russia need 400 channels open in S-400s. or at least 300 channels. That is 30x 10 =300.. 300x S-400s Triumf air defenses and all those defenses well integrated so they don't attack targets already being engaged by other missiles. THis is the reason i believe Offense is better than defense and also less expensive. Doesn't means ,im suggesting to not have any defenses. absolutely not. But that Russia needs to get as many cheap attack drones as they can make ,thousands and thousands of them. Enough to overwhelm any nation system of defense and destroy all their enemies long range artillery while remote controlling them by camera.. For nothing USA have plans to have 100,000 drones in the near future.. They using the pretext of "defense of cities from terrorist" as pretext to build so gigantic attack drone force. Not probably but this is exactly what it means and the reason why It is reported in this thread. Vann7 wrote: Probably means have 10 channels to engage 10 targets at same time using up to 2 missiles per channel IF they using the small range (9M96E) 40km missiles . 10 firing channels is 10 firing channels and you can use it with any missiles you have available be it small or big it DOES NOT MATTER! Vann7 wrote: Don't think that performance is about the very long range (real point of the S-400 defense )( 40N6) missile with 400km.. Only one missile fit per tube launcher. same with any of the 48xxxx series.With 200km or more range. Vann7 wrote: On another note Wikipedia says S-400 max ceiling is 35km.. is that correct? Usually ICBMs fly at 100km or more altitude. Iskanders at 50km altitude for comparison. We had reports about 60km altitude during testing and 185km altitude from S-400 chief designer. All the date available on different pages however refers to export models only. I mean ,that i think ,that the performance of the 20 missiles ,2 per channel only apply for small missiles with 40km range.. but if the targets are 400km away ,you can only use the Big missiles ,that only one fit in the tube at the same time. So 10 missiles for 10 targets at 200km-400km range. And 20 missiles when using the small missiles that have small range . Two can fit per tube. What will be nice that Russia do, is use their land ,special big zones as if it was a giant battleship. And have Reduct SAM cells in the ground in the hundreds..and combine that with highly mobile S-400s on mobile trucks they use. That way Russia can defend against surprise massive attacks of many hundreds of missiles launched at the same time with just a few dozens of operators in an office. also same capabilities for offensive weapons like Iskanders and or Kalibr missiles. That is mini -Silos for conventional weapons. That way Russia not only can easily counter a wave of a thousand of missiles fired at same time but also attack at any time any NATO country with such force too ,that is salvo attack of a thousand of missiles, and that without any warning to anyone of their intentions. No idea if such kind of offense capabilities is legal under US and Russia treaties. But very lethal for sure it is. IF you do it right.. you could destroy all capabilities to defend and attack of any nation and shut down all military bases of a hostile nation in one shot. All of this is referring to a battery's capabilities, not a TEL's. Does this clarify things? Of course, all of these numbers are pretty meaningless. In the way of information denial, the Russians always publish massively lower performance figures for their systems. Vann7 wrote: I mean ,that i think ,that the performance of the 20 missiles ,2 per channel only apply for small missiles with 40km range.. but if the targets are 400km away ,you can only use the Big missiles ,that only one fit in the tube at the same time. So 10 missiles for 10 targets at 200km-400km range. And 20 missiles when using the small missiles that have small range . Two can fit per tube. No. 20 for 10 targets per battery no matter what missiles you use (40N6 or 9M96 does not matter). Vann7 wrote: Two can fit per tube. 4 9M96 can fit the tube. and here found a picture the kind of underground defense Russia needs for a massive attack of conventional cruise missiles at the same time.. Imagine in Crimea and southern Russia they having a Thousand of underground super long range and medium range S-400s? Which such a system ,you can either launch a massive surprise attack of thousand of missiles at the same time to any part of NATO or Middle east without any warning of any troops movement. or defend from a massive surprise attack . This simply things significantly and more cost effective than having many trucks with armies defending everyone. Oh .. i see.. then 4 then. thanks.. Question is.. how many Trucks units with Tube launchers is an S-400 system? Two trucks with 5 tube launchers each? = 10 channels?